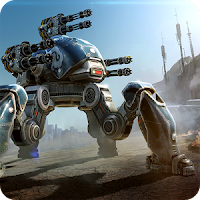 War Robots - manage invincible titans and smash everything in its path, the robot arm themselves with the latest weapons and armor is welded. Play against other players and earn credits that will be able to spend on improvements and the purchase of new iron monster. The game is very realistic graphics and beautiful special effects, a large number of jobs, and playing cards. Fight against your friends and win a victory, prove to everyone that you are the best of the best in the War Robots!